Sony has been one of the prominent manufacturers of camera sensors, especially for mobiles. Whether used on the DSLRs or smartphones, the camera sensors produced by Sony have created a name for themselves. In this article, we will compare the Sony Exmor’s IMX363 vs IMX519 in today’s post. Sony has launched the Exmor technology to work with smartphone cameras. 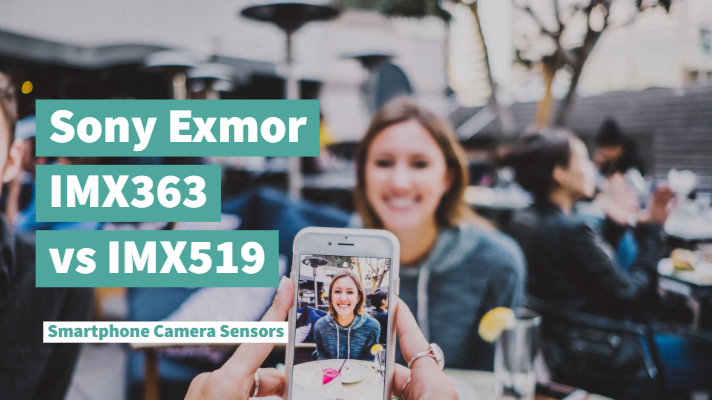 The IMX519 and IMX363 belong to this Sony Exmor genre and provide you access to an exemplary smartphone camera performance. Well, Exmor is a proprietary technology designed by Sony for its CMOS sensors. The technology was aimed at minimizing noise observed in the traditional CMOS sensors at higher ISO levels. The conventional sensors needed to carry analog pixel data before they are digitized. Exmor technology digitizes the pixel data earlier in the transfer process. The analog signals tend to move slower and thus introduce noise. With the digitized content, image data travels faster, thereby avoiding the occurrence of any pixel noise. The Sony Exmor RS sensor is designed to provide you with a stacked CMOS fabrication. The above image should provide an insight into the technology and how it works. Let us now check out the two capable sensors and the features that it offers you. Both these sensors come under the Exmor RS sensor category. As you are aware, the Exmor RS sensor is stacked CMOS sensor and belongs to the type that was launched back in 2012. The IMX519 happens to be one of the most recent options and offers you excellent imaging functionality. Which is the best option between Sony IMX519 and IMX363? The specific features that differentiate the two sensors include the following. Here are the key differentiating factors one by one. The IMX363 sensor supports full pixel dual core focusing. The IMX519 lacks this functionality. You can access 60 fps video recording features on the IMX519. On the other hand, the maximum frame rate provided by IMX363 is limited to 30 fps. 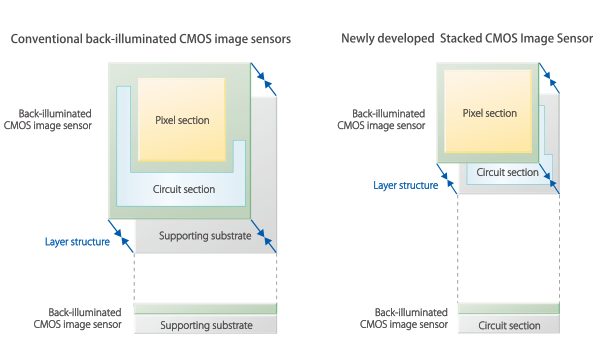 The CMOS sensor size remains similar across both the options. Both of them have a size of 1/2.6 inches. If you are looking at low light performance at higher ISO levels of the sensor, you will find the IMX519 offering you a better picture reproduction than the IMX363. Some of the advantages offered by the Sony IMX363 are a higher resolution; distortion-free images offered at low light situations, a better zoom functionality without compromising the image quality and offering clear images without any noise in low light. On the other hand, IMX519 gives you access to better video performance and better light sensitivity. You can find the differences if you check out the phones featuring the sensors. Comparing these two sensors may not be a perfect idea. The two options have been designed for special requirements and optimize different functions. The IMX363 is used on the Google Pixel 3 devices and provides access to 12.2 MP sensor compatibility. It sports a resolution of 4032 x 3024 pixels. The IMX519 sensor, on the other hand, comes with a 16 MP sensor and has been one of the recent options and comes with better imaging capabilities. Launched respectively in 2016 and 2018, the IMX363 and IMX519 offer you different functionalities and features. The comparison table here should provide you with an input into the salient features that each of these sensors offers you. Based on the above comparison, it should be clear enough that the two sensors come with almost similar features. The only difference we could observe among the two sensors is the megapixel count observed on the two competing options. Which phones utilize the two sensors? Well, the list should be impressive enough. Have a look here. Does it not appear to be an impressive and exciting list? That in itself should make it an excellent option to opt for either IMX363 or IMX519 based phone. Of course, there are not many devices that utilize IMX519 for obvious reasons. The sensor has recently been launched, and we expect more devices to join the bandwagon quite soon. We assume the post could guide you through a perfect comparison between the Exmor sensors from Sony. We presume the discussion above has been able to address the doubts you may have had concerning the functions and features offered by the two sensor siblings. Which sensor do you find more impressive among those two? Of course, unless you have used any of the smartphones utilizing those sensors, it may not be easy to understand the differences in a perfect manner. Do check any of those smartphones and share your views with the features offered by the sensors in each case. Do note that the sensor alone does not determine the camera quality on any phone. It is also dependent upon the camera app and software optimizations taken up by the device manufacturers. The same sensor on different devices may produce different devices and the Google Pixel is a prime example of that.